Product categories of Angle Drilling Machine, we are specialized manufacturers from China, Angle Drilling Machine, Steel Construction Drilling Machine suppliers/factory, wholesale high-quality products of Angle Rocker Drilling Machine R & D and manufacturing, we have the perfect after-sales service and technical support. Look forward to your cooperation! l 250*250*32mm angle size, hole dia. 22mm, SANDVIK drill bits, rotation speed 2200rpm, one hole takes 6 seconds. l One day (8 hours) gets 65 tons output. l 9 minutes finish one angle length of 14 meters, with 60 holes. 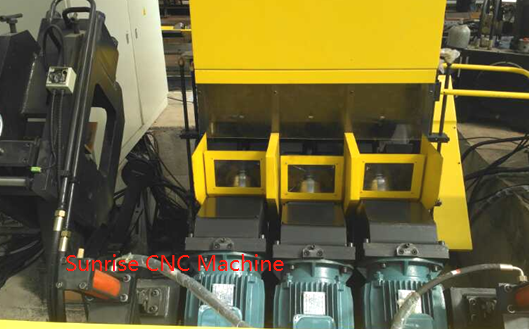 ▲Adopt CNC technology, servo motor infeeding, with high efficiency, stable working precision. ▲Key hydraulic, pneumatic and electric elements are all domestic and international brand. ▲Easy programming and can directly use the program data made by lofting software. ▲Software with Chinese, English interface, easy operation, and can display the drawing of workpiece. ▲Loading, marking, drilling and unloading are all performed automatically. ▲Just need to input size of work piece, diameter of holes, stadia and quantity of workpiece when edit program, or use CAD/CAM lofting software direct conversion. ▲The machining line is installed with supporting &straight pressing device. ▲With avoided shearing functions, so as to process fixed length angles. ▲Shearing unit is optional, using double blades cutting. 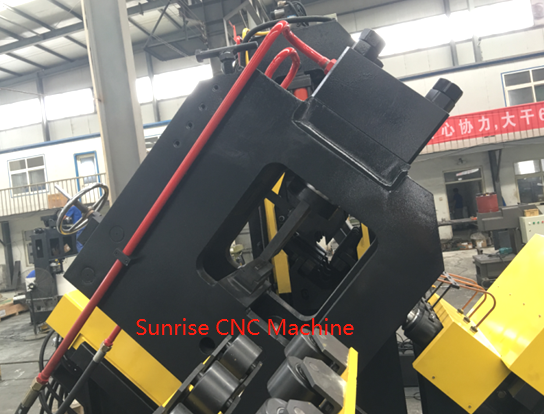 This unit is consists of fixed lathe bed, movable lathe bed, hydraulic pressure head and manual adjustment device. According to the order of computer, the unit marks on places required on the drawings. 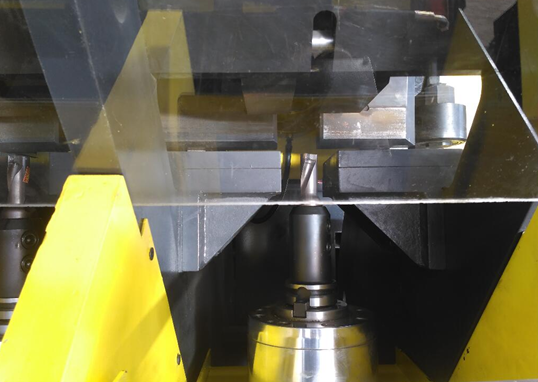 For making the marks clear and endurable, and avoiding the angle steel abrades character heads, it adds the functions of loading oil cylinder and lifting movable lathe bed. 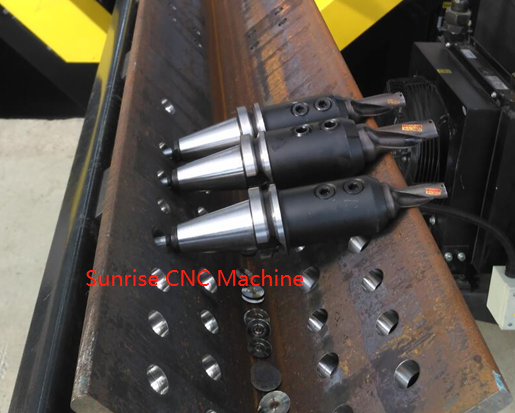 For satisfying the processing scope, it adds manual adjustment device, which can change the position of characters to adapt different standards angle steel. Workpiece Table: It is driven by engine and retarder through chain wheel and chain. There are three long axis and six self-control shaft couplings to achieve synchronization of the chains. Thus the angle steel will be stable and make lower noise during feeding process. The function of this part is that feed angle steel into the chute and prepare to be taken by the clamp device. Overturning Rack: It is driven by engine and retarder through chain wheel and chain. Thus it achieves synchronization of swivel arm of the four clamps devices through long axis and shaft couplings. The function of this part is to take angle from conveyor trough to feeding conveyor.